In December 2008, I posted the story about the accidental drowning of our two-year old nephew, Clinton Ryan. I will never forget the morning we received the phone call informing us of the tragic news. In the midst of this unimaginably difficult experience, our dear niece Reecie made the courageous decision to donate any of Clinton’s organs that might be needed to save or improve the lives of individuals awaiting organ transplants. In my blog post, I shared the letter that Reecie had written to the person who received Clinton’s eyes. Since Clinton Ryan’s death, Reecie has found a new purpose in life that she otherwise would never have chosen for herself — educating others about the importance of becoming organ donors. Reecie has encouraged parents to make the decision ahead of time to become organ donors and, in the event that anything should happen to their children, to make the life-giving and selfless choice that she made. 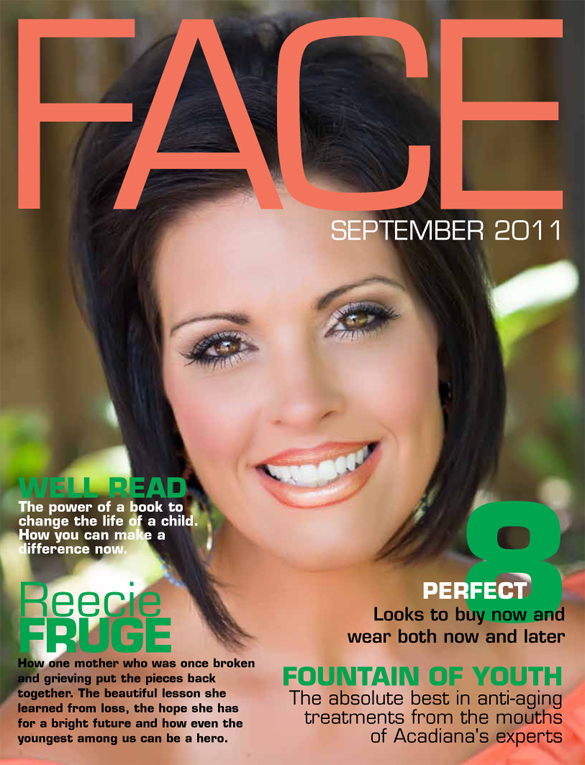 This month, Reecie’s story is featured in FACE Magazine, a publication about Lafayette women. Her beautiful photo is featured on the cover. The article is entitled Purpose Full. Please take a moment to read Reecie’s story about Clinton Ryan’s death — a story that is also about how God has faithfully sustained Reecie moment by moment and day by day. I am so proud of Reecie for finding and embracing a new purpose out of the darkest day of her life — a purpose that honors the memory of her sweet little boy but that also challenges others to give the gift of life to those awaiting organ transplants. We love you, Reecie! What a beautiful article. Thanks for sharing it, Omar. It sure ties in to our study of Job. I am a firm believer in organ donation too. My mother was given the gift of sight for her last years on earth because of the donations of corneas by two different families. I am forever grateful to them, and am a registered organ donor myself. What a marvelous way to partner with the Savior in giving life and healing others! Thanks, Pam. Great insight. Being an organ donor is indeed a great way to partner with the Savior in giving life and healing to others. Love it! My dad was blessed by a heart donor and we are major advocates for being a donor! Praise God for turning beauty from ashes! God’s stories are so beautiful! Amen. Thanks for being an advocate for organ donors. I was typing but I think it deleted what I was typing. I just wanted to thank you so much for posting this on your blog. It is a PLATFORM that our entire family stands on. It is such an important message to get families to just simply talk about! Clint’s Purpose is in full swing and to watch God work this this little hero just swells my heart with pride. He will never have the opportunity to be the star quarterback, decorated scholar, successful businessman or even just a DADDY. But because of a wonderful decision he had the opportunity to be a true HERO! How could a mom be any prouder???? I may never sit at the game that he would have shown off unbelievable talent (because given his size and genetic athletic heritage) I am sure he would have been my STAR athlete…..I know that without a shadow of a doubt….the pride I feel when people continue to remind me of how Clint has touched their life is a kind of pride that is enormous!!!!!!! You have inspired this journey for me sooooo much! When I first began what I call Clint’s Purpose, My Journey but God’s Mission….I sought you for guidance and asked that you please pray that whatever I do would be the will of God. I remember calling you when I first got involved and you were so instrumental and gave wonderful advice, caring words and assured me that you would cont to pray for us. Let me say…..God has worked daily miracles because never in my wildest dreams would I have thought that this would have grown to be so big, so fast and with a PEACE that is only sustained by God and God alone. The recovery and healing is a work in progress. My life changed 3 years ago because life became absent of Clint but his LIFE, and MESSAGE is more PRESENT than if he physically was still with me. My story is sad but this journey is absolutely beautiful! He was chosen and we as his family have been Chosen to carry out his legacy. That is what WE ALL ARE DOING, Including YOU!!!!!! One of my favorite quotes actually came from you. They even featured it in the article. You once told me that “Jus’t because you have a tragic situation…..it does not have to end a tragedy.” I LOVE THAT!!!! I say it all the time. End a tragedy it WILL NOT!!!!! I will spend the rest of my life being the voice of this hero and only hope that God continues to use me as his vessel. A wonderful message about….A child that had the opportunity to be a REAL HERO……A stranger to be able to SEE tomorrow….and a mother to be able to SPEAK through her sorrow!!!!!! This is only possible through GOD’S undeniable GRACE!!!!! Thanks, Reecie. Your wonderful work illustrates that God does give beauty for ashes. God has faithfully led you and you have obediently followed His leadership and embraced your new purpose. Only eternity will reveal the full impact of your life-giving mission. I am proud of you and love you. OHHHHHH have to use that saying too!!!!! It is our chance to partner up with GOD! I love that. Even though this is an example of everybody’s “WHAT IFs” somebody else will be chosen…. Today, tomorrow, the next day and the next day and the next because that is LIFE’S CYCLE but we have the choice to be donors or to say YES and that is LIFE RECYCLED!!!! Partnering up with GOD for a blessing that gives back to even more than recipients and recipient families…..it gives donors and donor families the chance to be a part and witness GOD and GOD’s MIRACLES. Sometimes (especially in my case) it was a decision that helped SAVE MY LIFE. I may not have needed a vital organ to still breathe but I have received a NEW HEART and God gave that to me through this situation! God promises blessings when we GIVE!!!!!!!! Very courageous, beautiful lady! I have a friend in Indiana that experienced a similar loss (her teenage daughter) and started a similar program to your Reecie in that state. A huge blessing to the families that receive those gifts. Amen. Organ donation is a great way to bless others after we die.